The family of Thomas Iseghohi, Group Managing Director of Transnational Corporation of Nigeria (Transcorp) Plc who was arrested by the Economic and Financial Crimes Commission (EFCC) has threatened the anti-graft agency to release him or face an avalanche of embarrassing revelations that might bring down the business and political establishment in Nigeria, should Iseghohi spill the beans. Iseghohi was arrested last week along with Deputy General Manager Mike Okoli, as well as the Company Secretary Mohammed Buba. News Agency of Nigeria (NAN) quoted an EFCC source, linking the men to a N15 billion fraud in Transcorp bordering on issuance of contracts, payment of professional fees, legal fees and consultancy fees to companies owned by their personal friends and associates. This indeed cannot be dismissed as an empty threat. Transcorp was incorporated by some of Nigeria's foremost business tycoons namely: Alhaji Aliko Dangote of Dangote Group, Chief Femi Otedola of African Petroleum (AP), Director General of Nigerian Stock Exchange (NSE), Dr.Ndi Okereke-Onyuike, (currently under investigation by the EFCC), Mr. Jimoh Ibrahim, Jim Ovia, Managing Director, Zenith Bank, Tony Elumelu of UBA, Fola Adeola of Guarantee Trust Bank, Jacob Ajekigbe of First Bank and former CEO of Nigerian Breweries Ltd, and Festus Odimegwu amongst others and the federal government. There have been reports in the media that former President Olusegun Obasanjo has equity interest in Transcorp through his company, Obasanjo Holdings. Current vice-President Goodluck Jonathan is also believed to have interests managed by his wife, Mrs. Patience Jonathan, who is alleged to have used Transcorp to siphon money abroad. The corporation has received significant presidential backing with lots of concessions granted the company in various areas of its operations putting it at an advantage over competitors. It also bought many government owned enterprises in the on-going privatization program. The most prominent among these companies are the Nigerian Telecommunications Limited (NITEL) and Nicon Hilton Hotel, Abuja (now Transcorp Hilton). Meanwhile, sensing what could be likened to the proverbial albatross, Transcorp's General Manager, Nicholas Okoro, in a statement condemned the arrest of the officials which, he maintained, have not been allowed legal representation. "We strongly believe in the supremacy of the rule of law and therefore advocate its full application in the handling of this issue. We note with great concern that the affected executives have been in detention for seven days without being informed of their alleged offence, given the prospect of bail or lawfully charged," the statement read. Okoro said the company lawyers, George Etomi and Joe Gadzama (SAN), have been instructed to legally pursue the enforcement of their fundamental human rights to habeas corpus and get them released immediately or charged to a court of competent jurisdiction. But Femi Babafemi, head of EFCC media and public relations, countered that the three are accused of using different companies owned by their friends and cronies, mostly based in America, as fronts to siphon the company's monies by inflated payments for bogus consultancy projects and contracts, and general mismanagement of the NITEL. Paid $100,000.00 to Global Information Tech Inc. based in Tampa, Florida, USA to investigate a fire incident at Nitel Property at Saka Tinubu in Lagos in addition to other monies paid to the company for other services. From 2007 to date $108 million was paid as monthly retainership fees to Ankor Pointe Integrated Ltd to manage Transcorp's oil block; the deal has been revoked by the Federal Government. From July 2007 to May 2008, $1.2 million was paid into an account domiciled in Cordova, Tennessee, USA; belonging to Global Employment Solutions Inc. (GESI) operated by one Mike Ike and allegedly owned by Iseghohi. Harmattan Ventures operated by one Akin Adebayo Doherty was paid $500,000.00 from December 2007 to March 2009 for organizing a meeting for Iseghohi overseas. Lansak International Ltd was paid N64 million for an office space not in use. The said contract was handled by one Henry Chagoury, the elder Chagoury. Constance Security Services Ltd, paid N5 million to investigate allegation of fraud against the Deputy GM Okoli, and Company Secretary Mohammed Buba; approval for the money was given by the same Okoli. Asasa Enterprises Nigeria Ltd was paid N35 million for unspecific consultancy services. Between May 2007 to September 2008, Iseghohi allegedly paid Centre Spread over N233 million and another N205 million as legal fees was paid to unspecified persons within the same period. Other companies who benefited from the indiscriminate payments are Amplified Nigeria Ltd, which in nine months received N103 million and Costumes Services Ltd, which also got N4.9 million over the same period. In sum total, the top Transcorp leaders are alleged to have siphoned about $75 million from the company's coffers between July 2007 and May 2008. The trio are also accused of deliberate refusal to submit audited accounts of the company, thereby shortchanging shareholders and also using NITEL/MTEL to siphon money through arranged consultants. Investigations showed that in less than one year, the group Managing Director approved the payment of 1.2 million dollars (about N174 million) to Global Consultancy as fees and N230 million to Centre Spread FCB. They are also being prosecuted for illegally concessioning the nation's SAT3 undersea cable owned by NITEL without government's approval, thereby undermining national security. The Bureau of Public Enterprises (BPE) had, in the latest attempt to resell NITEL/MTEL, discovered fresh debts running to billions of naira exclusive of the over N500 million salary arrears and the N15 billion severance package. BPE, baffled by the huge debts, decided to verify the debt claims inviting creditors to come forward to ascertain their credits to NITEL and MTEL. Meanwhile, the SSS has also drilled the controversial Transcorp Board Chairperson, Mrs. Ndidi Okereke-Onyiuke, over the alleged scam rocking the business conglomerate. Okereke-Onyiuke, Huhuonline.com has learnt, used her position as Board chair to muzzle Iseghogi as GMD. A source told Huhuonline.com that she was invited to the SSS headquarters to answer some questions regarding the controversies and allegations of fraud involving the top hierarchy of the company. 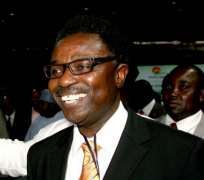 The bulky Okereke-Onyiuke, who doubles as Director-General of the Nigeria Stock Exchange (NSE) is no stranger to the SSS and the EFCC having been arraigned last year in connection with the Africans for Obama fundraising.